Futures for the Dow Jones Industrial Average today (Thursday) forecast a 89-point decline after oil prices slipped again and the Challenger report indicated that layoffs hit their highest levels in six months in January. According to the report, retail and energy companies issued the most pink-slips last month. Meanwhile, the U.S. Labor Department reported the final weekly jobless report before the January unemployment report is released on Friday. Yesterday, the Dow Jones Industrial Average added more than 183 points as oil prices rocketed higher and private payroll figures indicated the U.S. jobs market continues to steam along. The Nasdaq slipped 11 points as tech stocks underperformed on the day. 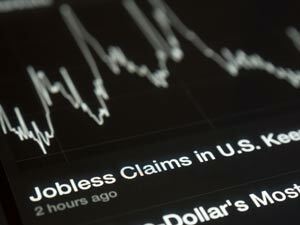 The Stock Market Today: Investors will keep an eye on weekly jobless claims, a monthly update on productivity and costs, and three speeches by U.S. Federal Reserve officials. In addition, retail stocks will be in focus when the monthly chain store sales report is released in the morning. Meanwhile, Asian markets pushed higher this morning, with the Shanghai Composite Index gaining more than 1.5% thanks to a slight downturn in the U.S. dollar. Oil Watch: Crude oil prices dipped this morning despite news that the U.S. dollar slid against a basket of global currencies. Traders do not anticipate that the Federal Reserve will be raising interest rates in the near term, a sentiment that had been pushing commodity prices higher. WTI crude dipped 1.5% to hit $31.78 per barrel. Meanwhile, Brent crude fell 2.1% to hit $34.30 per barrel. The bears might be dominating the discussion now, but here's a breakdown on why prices will move higher in 2016. Earnings Report No. 1, LNKD: Shares of LinkedIn Corp. (NYSE: LNKD) fell 6.1% yesterday ahead of ahead of the social network's fourth-quarter earnings report, which will be released after the bell today. Wall Street anticipates that LinkedIn will report per-share earnings of $0.79 on top of $861.2 million in revenue. Earnings Report No. 2, RL: Shares of Ralph Lauren Corp. (NYSE: RL) plunged 12% after the retailer badly missed fiscal third-quarter bottom-line revenue expectations. Wall Street projected that the company would report an EPS of $2.10 on top of $2 billion in revenue. Although Ralph Lauren reported a strong EPS of $2.27, the firm underwhelmed with a revenue figure of $1.9 billion during the third quarter. Additional companies reporting quarterly earnings include Deckers Outdoor Corp. (NYSE: DECK), Cummins Inc. (NYSE: CMI), Tableau Software Inc. (NYSE: DATA), Outerwall Inc. (Nasdaq: OUTR), and Symantec Corp. (Nasdaq: SYMC). Stocks to Watch No. 1, HOG: Shares of Harley-Davidson Inc. (NYSE: HOG) were off 0.55% this morning despite news that its board of directors passed a measure to boost its dividend by 13%. The dividend will be $0.35 per share in the first quarter. Stocks to Watch No. 2, CSCO: Shares of Cisco Systems Inc. (Nasdaq: CSCO) are down 0.5% on news that it has purchased "Internet of Things" manufacturer Jasper Technologies Inc. for $1.4 billion in cash and equity. Jasper's technology connects devices like cars and medical devices to the Internet. The deal is Cisco's largest since 2013, when it purchased security firm Sourcefire for roughly $2.7 billion. Stocks to Watch No. 3, SYT: Shares of Syngenta AG (NYSE ADR: SYT) gained another 1.8% in pre-market hours on news that the Swiss seed and agrichemical giant agreed to sell itself to ChemChina for $43 billion. The deal is a blow to rival Monsanto Co. (NYSE: MON), which had made several attempts to purchase the firm in 2015. Stocks to Watch No. 4, HMC: Shares of Honda Motor Co. Ltd. (NYSE ADR: HMC) were sliding again on news that the company plans to recall more than 340,000 Accord vehicles due to concerns that the airbags may not deploy in an accident. The recall affects vehicle models from the years 2008 through 2010. Boston Federal Reserve Chair Eric Rosengren speaks at 2:15 a.m.
Dallas Federal Reserve Chair Rob Kaplan speaks at 8:30 a.m.
Cleveland Federal Reserve Chair Loretta Mester speaks at 5 p.m.